There is so much marketing hype surrounding laser hair removal that it's difficult to truly understand i) how effective the treatment is and ii) customer satisfaction levels following treatments. Study 2 - 84% Patient Satisfaction Levels for those with Darker Skin Treated by the Nd:YAG LaserWhat Conclusions Can we Draw from This? Laser hair removal is still a bit of an enigma. Whilst we claim to understand how it works and the people that are likely to get the best results from it, there are areas of knowledge that still elude us. Paradoxical laser hair removal (the phenomenon whereby sometimes laser hair removal can actually trigger increased hair growth) and also the fact that laser hair removal can be ineffective on a small number of people with the perfect physical properties of light skin and coarse, dark hair are two of the most obvious that spring to mind. 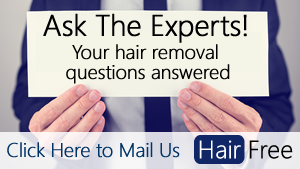 Given that edge cases such as those mentioned above exist, how effective is laser hair really? This study, carried out in 2003, asked patients of long pulse ruby, alexandrite and Nd:YAG laser hair removal treatment to rate their satisfaction on a scale of 0 to 10. A 0 score means that the patient thought laser hair removal was very much worse than an alternative method of hair removal treatment. And 10 is the opposite, whereby the patient believed that laser hair removal was very much better than any alternative. "In terms of hair removal, 71% of patients were satisfied with their treatment." 71% satisfaction rate is a good result. When compared with electrolysis, laser hair removal received a score of 8.6 and when compared with waxing it received a score of 7.7. In other words, according to this study, patients preferred laser hair removal over waxing and even more strongly preferred laser hair removal over electrolysis. ​While the results are positive, the authors of the study were associated with "Birmingham Skin Centre, City Hospital and Lasercare Clinics". This doesn't necessarily mean that the study is incorrect, merely that there is a potential conflict of interest at play. In this study published in 2012, fifty patients of ethnic minority and Fitzpatrick skin levels of VI (very dark skin) were treated with the Nd:YAG laser for unwanted hair. After the treatment, they were asked to rate their satisfaction on a scale from 0 (completely unsatisfied) to 100 (completely satisfied). "All patients were satisfied with Nd:YAG LHR treatment with the mean satisfaction score of 84.2"
This had a relatively decent sample size of 50 and seems a more reliable source of evidence for true customer satisfaction levels for laser hair removal. Some background information about this study: The Nd:YAG laser is a recent technological invention that allows people with darker skin to safely have laser hair removal performed. It has a higher wavelength than the other lasers and therefore patients with darker pigments are less likely to suffer the side effects that they would receive from other types of laser. Frankly there is not enough scientific evidence to draw a very firm conclusion. One of the two studies was done by authors with a clear conflict of interest and the other study focused on ethnic skin tones of VI on the Fitzpatrick scale. However, while these are the only two studies that specifically measure patient satisfaction levels, there are tens of studies that look at both the efficacy and safety of laser hair removal. While analysis of these studies is out of scope for this article, the overwhelming majority state that laser hair removal is both very effective and safe for a large percentage of the population.